SkyDrones develops custom mobile apps to automate specific projects of our clients. 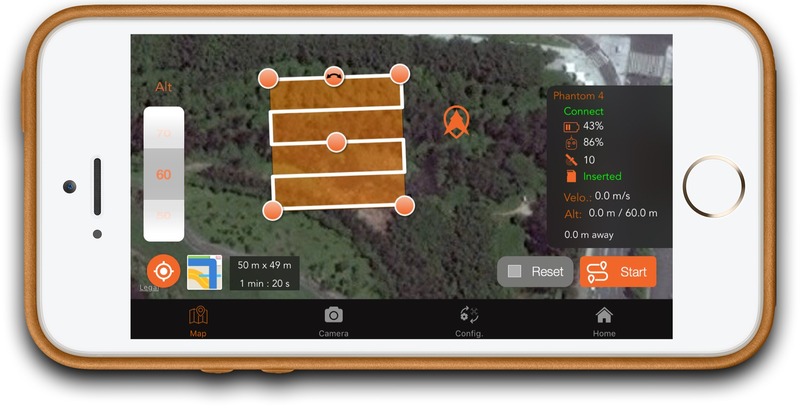 Check here the free version of SkyDrones App for aerial mapping. In 2016, SkyDrones launched the first mapping app in Latin America and continues to update it with new functionalities. Besides this free version, we also develop custom apps and drones to automate specific needs of our clients. You can turn DJI* drones in a safe tool for mapping, measurement and data capture through flight missions for automatic image capturing. Join more than 1000 users over 160 countries and become a professional in mapping made easy and quick. You choose the area that you want to map. Start a fully automatic mission. Interrupt the mission any time in case of danger. You choose altitude, speed, overlapping, camera angle and capture mode. Supports DJI Phantom 3 and 4 Standard, Phantom 3 Advanced, Phantom 3 and 4 Pro, Inspire 1, Matrice 100 and 600. Online since 2016 with hundreds of users! Geotagged images are taken automatically. More than one line, making a better 3D reconstruction of the object. Example: a tower. Checklist to make your mission more safe and productive: the app analysis information such as GPS, homepoint and if the drone is correctly connected. Offline mission: you create a flight plan for any mission type, chose the camera you want, set the details and save then save it, running it anytime you want*. Upload of an area (polygon) in KML format (Google Earth) to the app*. After the flight, the mission will be saved in the mission planner and the drone will automatically return to the homepoint. During the flight, you can track the drone’s path, his telemetry and a live video from the camera. Download here the free app!